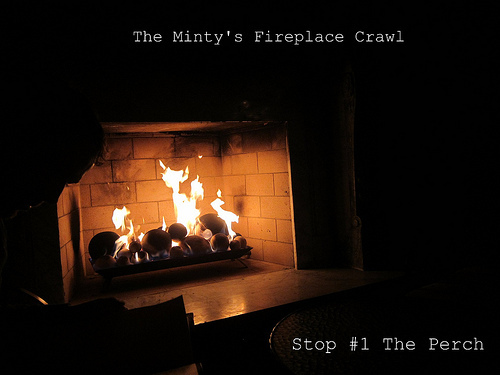 I have wanted to do a fireplace crawl for several years now but by the time I was ready to do so, it always got too warm. I’m glad I organized this field trip to some of Downtown Los Angeles’ coziest fireplaces this past Wednesday. First we went to The Perch which was partially the inspiration for a crawl in DTLA. 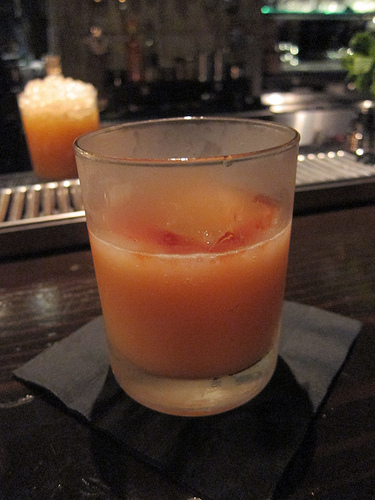 I had a Jacques Collins since I liked it previously. This night, The Perch was having a jazz and oysters night. 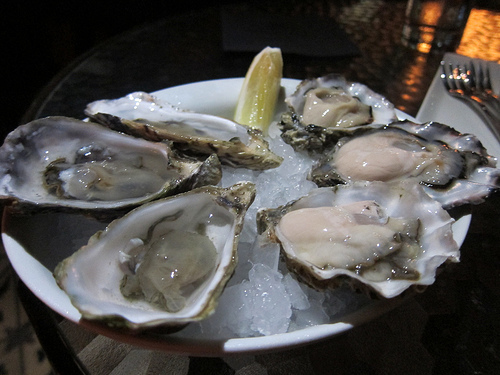 We were treated to Baja Cove, a briny oyster and Eagle Rock which is from Washington. 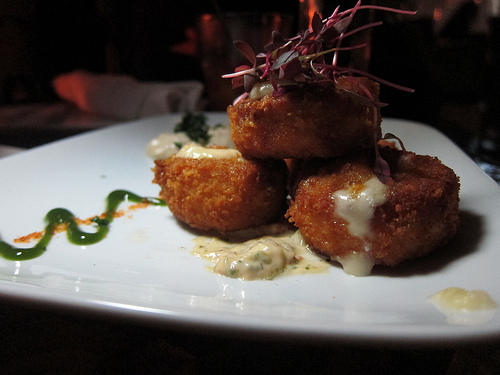 Those oysters were more creamy and my favorite. 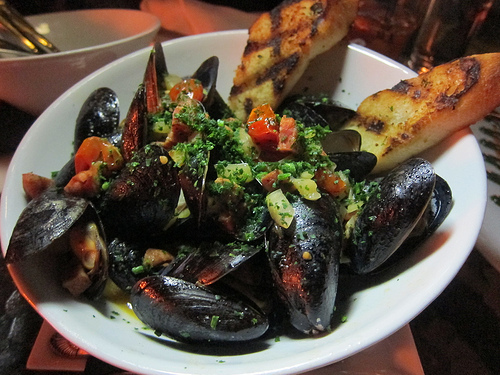 We also had the Cordon Bleu poppers and my favorite mussels. 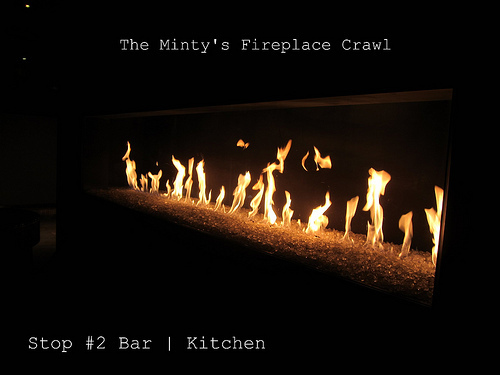 All great since it appeared that a fireplace crawl required some time to contemplate rather than a speedy bar crawl. 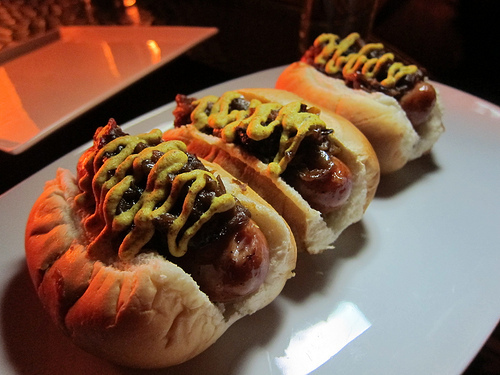 The Perch then sent out mini hot dogs. As a tribute to the street vendors down below, they’re going to start offering mini hot dogs as part of the late night menu. The Perch really does have one of the best views of the city. I am thinking about a patio or even better, a rooftop crawl in the Spring or Summer. We’ll be back! Since we spent so much time at the Perch, we decided to skip Library Bar and go straight to Bar | Kitchen where the large fireplace was going in the lobby. 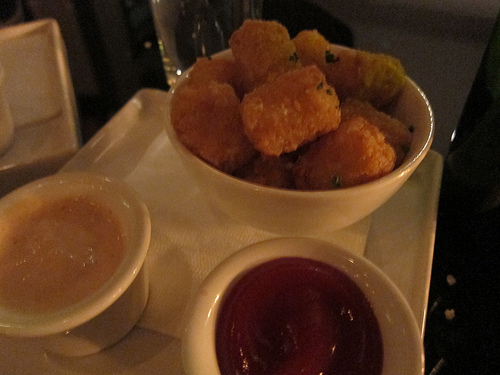 We camped out and proceeded to order several “crack” tater tots and even scored a half-order with a foursquare checkin (thanks Wilson’s Where To Guide for the tip!). In honor of the new Chapter & Verse lab opening, I had the Chapter & Verse (rye, Amontillado sherry, amaro, elderflower, Benedictine, bitters). It’s not open to the public but I hope to see it one day. The fireplace is magnificent but I do love the bar more. 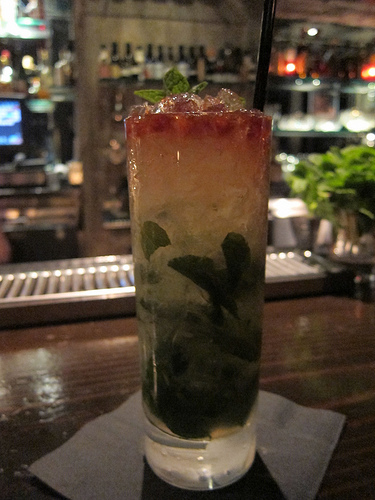 We hopped a block and half away to Cana Rum Bar. The fireplace was occupied so we got a couple of drinks at the bar until it cleared out. Beautiful and just the kick of warmth I needed to go outside to sit by the fireplace. Our bartender promised us he’ll work on a warm drink the next time I come in. 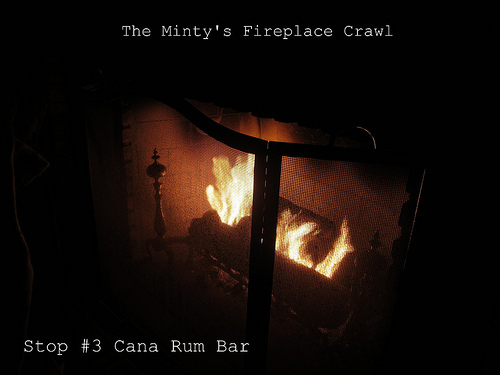 Thanks to everyone who made it to the fireplace crawl! I was recently given a list of more bars in LA with fireplaces so this could become a regular feature- fireside chat with the Minty! glad it came to fruition! looks so cozy.